The ashy-headed green pigeon (Treron phayrei) belongs to the family of doves and pigeons, the Columbidae. 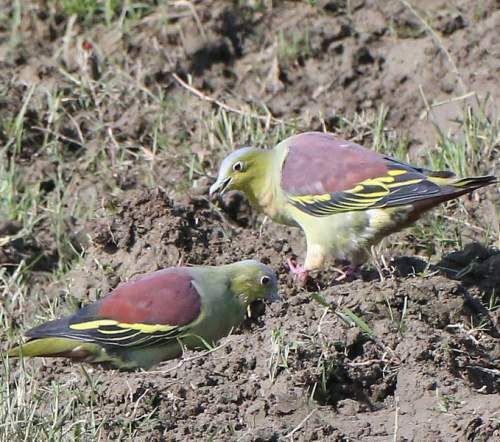 The ashy-headed green pigeon species is distributed in India, Nepal, Bhutan, Bangladesh, Myanmar, Thailand, Cambodia, Laos, Vietnam and China. These pigeon species have been listed as 'Near Threatened' by the IUCN. These pigeons are monotypic species. The ashy-headed green pigeon (Treron phayrei) is a medium-sized pigeon, measuring 25 to 30 cm in length. These species are sexually dimorphic. 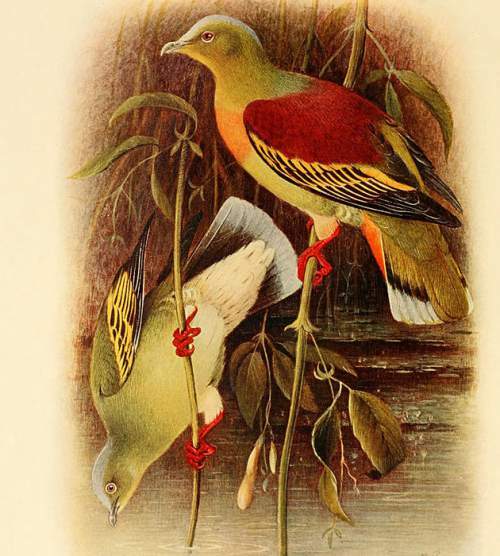 The overall plumage of the ashy-headed pigeon is greenish. The male has chestnut back and wings. In the female, the back and wings are greenish. The wings have prominent yellow edging on flight-feathers. There are yellow bars across coverts. Both the male and the female have greenish gray head with grayish crown. There is a orange-yellow breast patch. The males have rusty undertail coverts. The bill is short and heavy-based and is pale gray in color. The irises are dark brown. There is a white eye-ring. The legs are reddish. Their call is a series of low-pitched fluty whistling "keak..kee..oiee" sound. 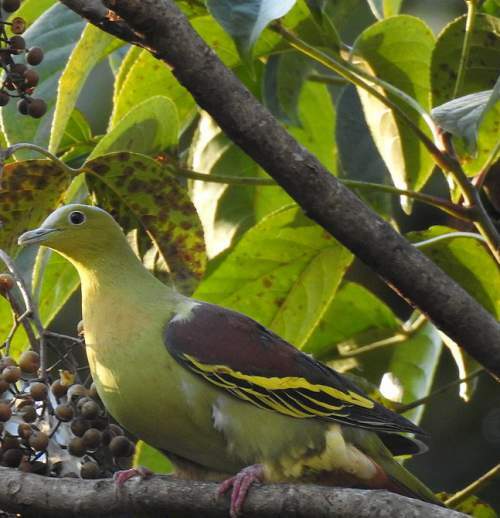 The ashy-headed green pigeon species are distributed in India, Nepal, Bhutan, Bangladesh, Myanmar, Thailand, Cambodia, Laos, Vietnam and China. In India, these ashy-headed green pigeons are distributed in the states of Bihar, Jharkhand, West Bengal, Sikkim, Assam, Meghalaya, Arunachal Pradesh, Nagaland, Manipur, Tripura and Mizoram. These ashy-headed green pigeon species have high forest dependence. They normally occur in altitudes from 0 to 1000 meters. The natural ecosystems and habitats of these pigeon species include, tropical and subtropical moist lowland forests, foothill forests, hill forests, moist-deciduous forests and semi-evergreen and evergreen forest at low elevations. The diet of this ashy-headed green pigeon consists mainly of fruits. Wild fruits, berries, figs and seeds are their primary food. The ashy-headed green pigeons mostly forage for fruits and berries on the branches of trees. The breeding season of these ashy-headed green pigeon species is from March to July in most of their ranges in India and southeast Asia. The nesting sites are usually located on low branches of trees and thickets. The nest is a flimsy platform of sticks and twigs. These ashy-headed green pigeon species are monogamous and territorial. Both parents take part in building of nest, incubation of eggs and care of young. The clutch usually contains two white eggs. The chicks hatch out in 12 to 14 days and are altricial. The ashy-headed pigeon nestlings are initially fed with regurgitated crop-milk, a secretion from the lining of the crop of parent birds. Later the nestlings are fed with regurgitated fruits, seeds and plant matter. These ashy-headed green pigeon species are non-migrant, resident birds. They disperse locally after breeding. The populations in higher altitudes descend to the lower levels in winter. Post breeding, the juvenile pigeons may disperse and establish in new locations within the range. Within their range they may make local movements for feeding and breeding. The global population size of the ashy-headed green pigeon (Treron phayrei) has not been quantified. The overall population trend of the species is considered to be decreasing. In most of its range, this pigeon species is reported to be rare and locally common. The generation length is 4.2 years. Its distribution size is about 3,100,000 sq.km. Habitat alteration and destruction, deforestation, hunting and capture for pet-trade are the main threats that are endangering the survival of these pigeon species. The ashy-headed green pigeon (Treron phayrei) is approaching the thresholds for being Vulnerable under the range size criterion, under the population trend criterion and under the population size criterion. The CITES (Convention on International Trade in Endangered Species of Wild Fauna and Flora) status is ‘Not Evaluated’ for ashy-headed green pigeon (Treron phayrei). The ashy-headed green pigeon (Treron phayrei) is closely related to Sri Lanka green pigeon (Treron pompadora) and grey-fronted green pigeon (Treron affinis). Current topic in Birds of India: Ashy-headed green pigeon - Treron phayrei.